Hilary Moss argues for the need for accredited and on-the-job training for artists working in healthcare settings to ensure best arts and heath practice and place the work of artists in this field on an equal footing with health professionals. Can good arts and health practice be taught? A well documented gap has emerged in the arts sector regarding the training and professional development needs of artists. (2) In 2006 I was part of a group who consulted 50 national and international institutions and individuals regarding arts and health training needs. (3) A number of key themes emerged during the consultation, which I would argue are central to any course for artists working in health settings. These were ethics, person-centred care, self-awareness, arts and health best practice, placements and mentors, overview of the nature of disease, facilitation and group work skills, the nature of collaborative practice, research, communication, project planning and standards of practice. Key themes arising from the consultation with health professionals included the need for artists to better understand how the health system works; the role of different professionals; understanding the clinical team; the importance and individuality of the patient and prioritising the medical needs of the patient; confidentiality and ethics and professional conduct within a healthcare organisation. Whilst there are a number of training courses internationally for arts and health practitioners, (such as established arts therapies professional qualifications and medical humanities courses in medical schools) there is perhaps a need for the health sector to formalise the current ad hoc approach to employing artists in healthcare settings. In a hospital environment, for example, nearly every other professional (e.g. chaplains, nurses, social workers etc) has completed a recognised, accredited course to equip them with the skills to work in this healthcare setting, but artists are unlikely to have done so or have been required to by health services to date. Artists bring an important and creative perspective to healthcare, challenging established practices in often slowly changing environments. Artistic freedom is important. However, it is equally important that artists are adequately prepared for work with vulnerable people. The needs of the patients are paramount and artists must supplement their artistic skills with a range of skills common to health professionals of all disciplines. For example, in our hospital we have experienced difficulties with inexperienced artists making unrealistic requests, misunderstanding issues such as patient confidentiality, or failing to relay important information to members of the multidisciplinary team. It is my view, therefore, that artists working directly with patients or interacting with them at any level within healthcare organisations need to ensure the quality of the service provided and that the standards of practice are high. An accredited professional qualification would meet these needs, which is why I welcome the development this year of the first post-graduate certificate in arts and health at NUI Maynooth. Introductory courses: for example, at the National Centre for Arts and Health we offer a work placement scheme whereby artists can gain experience of working in arts and health, with induction and training courses. Mentoring and supervision: can be an important way to develop practice and learn as the artist works. A reflective, supportive space with an expert in the field who can guide the work is important at any stage of a professional’s career. Continuous Professional Development (CPD): is a practice adopted by nearly all health professionals and involves attending relevant training courses to maintain the knowledge and skills related to their professional lives. It is important to note here that what can count as CPD for a professional can be related training not just direct arts-based work (for example attending courses on bereavement, artistic practice development or other relevant issues). Recognised accredited courses: recognised and accredited courses currently exist for arts therapies and medical humanities. Placements and mentoring: not all training takes place in educational institutions. Apprenticeships, observation and work placements are important ways for artists to learn. It is my opinion that all the above are important for artists who are serious about their professionalism and quality of work in healthcare settings. There is, however, a need for recognised accredited courses as the gold standard of training and development. Health professionals, such as the arts therapies are guided by professional associations that oversee standards which require members to fulfil a certain number of CPD hours each year and undergo professional supervision. The aim behind all of these activities is to ensure that those working in the health service are professional, capable and recognised as competent to work and, above all, to protect the clients for whom a service or project is being delivered. So, can good arts and health practice be taught? My experience indicates that personal characteristics, temperament, values and approach to working life are key factors to be a ‘good’ arts and health practitioner. These cannot necessarily be taught. However, engaging in a relevant training course can serve three crucial functions: fill in the gaps in our knowledge and experience (e.g. confidentiality and ethics); teach the tools of self reflection and awareness; expand our knowledge of high quality practice both nationally and internationally and so raise our standards and expectations. These are crucial elements in working sensitively with vulnerable people and in healthcare teams. A final, important point is that the patient/client must be at the core of our work as arts and health practitioners, and the patient’s needs must ultimately come before artistic freedom. At present there are excellent artists working in health settings and mavericks who can and do cause quite serious problems for patients. Accredited training is essential to regulate this area of work and to allow artists the opportunity to work freely and effectively in this setting. The development of standards in arts and health practice would also serve to ensure countrywide consistency and the skills of arts and health practitioners would also be more easily recognised by other professional groups working in the health service. It is hoped that this paper will provoke debate and that training will continue to be developed to meet the needs of both patients/clients in the health service and artists. 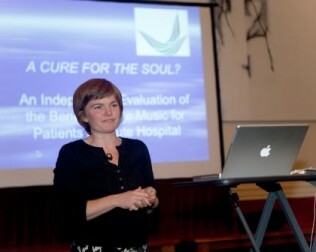 Hilary Moss, MBA in Health Services Management, PGDip in Music Therapy, B.A. (Hons) is Director of the National Centre for Arts and Health at the Adelaide and Meath Hospital, Incorporating the National Chidren’s Hospital, Dublin. She is also a PhD student and Adjunct Lecturer at Trinity College Dublin School of Medicine. (1) A consortium made up of the Adelaide and Meath Hospital, Incorporating the National Children’s Hospital (AMNCH), The Institute of Art Design and Technology, Dun Laoghaire (IADT) and CREATE the national development agency for collaborative arts was commissioned in 2004 by the Arts Council of Ireland to research, develop and implement a training course for artists working in healthcare settings. Following this I developed a new post graduate course for artists at NUI Maynooth. Really good article. I’m almost finished my masters in Art Psychotherapy in the UK which is recognised by the HPC. I was surprised to find Ireland doesn’t have an equivalent for those involved in Arts and health. I think everyone in this area should be required to have supervision at the very least.